The recent spat between the ruling Congress and the main Opposition BJP over the legacy of India’s ‘Iron Man’ Sardar Vallabhbhai Patel has reignited the debate over the differences among the stalwarts on key issues pertaining to the nation’s unity and identity. It has also brought to the fore certain bitter truths about the then political leadership, which has hitherto been brushed under the carpet as even their discussion was considered not only politically incorrect but also blasphemous to a great extent. The pre-independence Congress was not a party but a movement of freedom fighters among whom included people from all shades and ideologies. It was due to this fact that Mahatma Gandhi, despite not being a member of the Congress party, was accepted as the Supreme leader. For a greater understanding of the freedom struggle and the politics of those turbulent times, it becomes important to understand the historical facts and context pertaining to the election of India’s first Prime Minister and Sardar Patel’s stand on contentious issues such as Article 370 and religion based reservation, which continues to be widely debated to this day in the country. By the time World War-II was coming to an end, it was becoming clear that India’s freedom is not very far. It was also very clear that it will be the Congress President, due to the number of seats the party had won in the 1946 elections, who shall be invited to form the Interim Government at the Centre. Thus, suddenly the position of the President of the Congress Party became a matter of great interest. Once the election to the post of Congress President was announced, Maulana Abul Kalam Azad expressed his desire for re-election. This move of the Maulana “agonized Azad’s close friend and colleague Jawaharlal who had his own expectations.”1 However, Gandhi had made his choice known in favour of Nehru on 20th April, 1946. This was not the first occasion that Gandhi spoke about his choice of Nehru. He had been speaking about it for the last several years. However, despite Gandhi’s open support for Jawaharlal Nehru, the Congress Party overwhelmingly wanted Sardar Vallabhbhai Patel as the President and consequently the first Prime Minister of India, because it considered Patel as ‘a great executive, organizer and leader”2 with his feet firmly on the ground. April 29, 1946 was the last date for the nominations for the post of the President of Congress, and thereby the first Prime Minister of India. It is pertinent to note here that by this time Gandhi had already made his choice known. Still 12 out of 15 Pradesh Congress Committees nominated Sardar Patel. The remaining three may not have nominated Patel but then they did not nominate anyone else also including Pt. Nehru. Thus, no Pradesh Congress Committee proposed the name of Jawaharlal Nehru even on the last day of filing the nominations i.e. April 29, 1946. “After weighing the pros and cons, I came to the conclusion that the election of Sardar Patel would not be desirable in the existing circumstances. Taking all facts into consideration it seemed to me that Jawaharlal should be the new President…. “I acted according to my best judgment but the way things have shaped since then has made to realize that this was perhaps the greatest blunder of my political life. I have regretted no action of mine so much as the decision to withdraw from the Presidentship of the Congress at this junction. It was a mistake which I can describe in Gandhi’s words as the one of Himalayan dimension. Thus, not only the people of this country, but even those great Congressmen who supported Nehru to become Prime Minister regretted their action later on. “I find there are some substantial changes over the original draft, particularly in regard to the applicability of fundamental rights and directive principles of state policy. You can yourself realise the anomaly of the state becoming part of India and at the same time not recognising any of these provisions. “I do not at all like any change after our party has approved of the whole arrangement in the presence of Sheikh Sahib himself. Whenever Sheikh Sahib wishes to back out, he always confronts us with his duty to the people. Of course, he owes no duty to India or to the Indian Government, or even on a personal basis to you and the Prime Minister who have gone all out to accommodate him. Things became more and more complicated due to the reopening of the Constitution Draft, already unanimously approved by the Constituent Assembly, and that too without anybody raising any note of dissent. Abdullah and three of his colleagues were present when this draft (Article 306-A) dealing with Kashmir was approved by the Constituent Assembly. They also did not raise any objection or moved any amendment to it. Still, Gopalaswamy and Nehru thought it prudent to open the chapter and start drafting the whole thing afresh (which came to be known as Article 370) as per the whims and fancies of Sheikh Abdullah and his cronies. The state got a Constitution of its own which was an unfortunate by-product of Article 370. No other State of the Indian Union has a separate Constitution. All other States have a uniform structure as per the Part IV of the Constitution. The question that now arises is as the inheritor of Sardar Patel’s legacy, does the Congress feel, like Sardar Patel, that Article 370 is not the right thing and it need to be dealt with? As a part of Sardar Patel’s legacy, does it have any plan abolish Article 370 and make Jammu and Kashmir at par with all other states? If not that can it restore proposed Article 306A that was agreed upon and approved by the Constituent Assembly? Right from the Congress party to all other political parties who claim to be the protector of minority (read Muslim) interest are now clamouring for separate electorates and job reservations for the Muslims in the name of religion. Some states have gone ahead with such reservations defying the High Court and Supreme Court directives. The Central Government headed by the Congress party appointed Sachar Committee to look into the problems faced by Muslims and Prime Minister Dr Manmohan Singh declared from the ramparts of Red Fort that “Minorities, particularly Muslims, have the first claim on the (nation’s) resources”. Not that this issue was not discussed in the Constituent Assembly. It was discussed and the entire debate is available in Volume V of the Constituent Assembly Debate. Sardar Patel also spoke on the issue. Can the Congress, as the ‘true’ inheritors of Patel’s legacy stand by these statements and uphold the interest of the nation rather than indulge in vote bank politics? Raj Mohan Gandhi, 1991, Patel: A Life, Ahmedabad, p. 369. Durga Das, India from Curzan to Nehru, New Delhi, p. 230. Raj Mohan Gandhi, 1991, Patel: A Life, Ahmedabad, p. 370. Maulana Abul Kalam Azad, India Win Freedom, New Delhi, pp. 162. The last two paragraphs of the quotation were withheld from the publication. As per the will of Azad many of the paragraphs, including these two, were published thirty years after his death. Swarajya, 27.11.1971; also quoted in Rajmohan Gandhi, Rajaji: A Life, p. 443, Penguin. Balraj Madhok, 1954, Dr. Syama Prasad Mookerjee, New Delhi. N. Gopalaswamy to Sardar Patel, letter dated 15 October, 1949, In Durgadas (ed), Sardar Patel Correspondence, 1945-1950, Ahmedabad, p. 302. Constituent Assembly Debate, Vol. 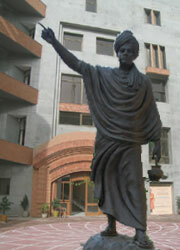 V, Lok Sabha Secretariat, New Delhi, pp. 225-26.